The MR3 was born by accident. It was the result of extended "play times"! 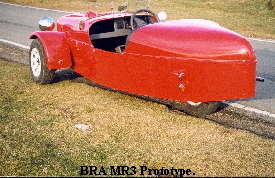 The original concept was to use a Mini front sub frame, complete with all mechanical components, attached to simple chassis rails and a install a single Mini suspension unit at the rear. 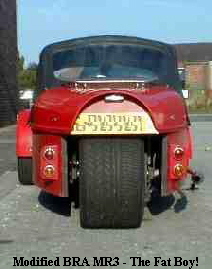 In this guise, in 1994, the car existed as the "Mini Plug". The Plug was a one off creation from the mind of James Mather. It is assumed that he had experienced a bad week at work and created the Plug during the weekend in order to cheer himself up! The Plug was quite extraordinary. The most basic of cars and quaintly ugly. For performance and handling though the Plug was quite remarkable. We have calculated a power to weight ratio similar to that of a modern super cars and, on three wheels, that can be rather exciting! 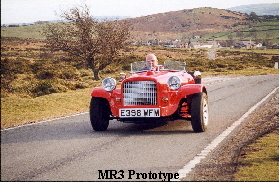 In 1999, during tea breaks and stay-behinds in our Flintshire factory, the MR3 was developed. The car used the mechanical components from a Rover Metro, utilising the front sub frame complete with engine, transmission, suspension, etc. The sub frame bolted to the space frame chassis and the rear end was supported by a single Metro rear suspension arm with coil over damper. The prototype, shown above and right, proved that the car had exceptional handling and cornering capabilities and with a basic, unmodified, 1000cc engine installed performance was more than brisk! Once the chassis design was finalised the body work was redesigned and the production of moulds was contracted to a specialist GRP company in North Wales. Unfortunately the GRP company went out of business and the partly finished moulds were returned to us. Sadly this happened again with the second specialist we contracted.... and the third!!! Due to the massive costs involved in failed attempts to find a suitable GRP contractor the MR3 was shelved in 2000. The prototype was sold in 2001 and remains a one off although a modified "high speed" version (pictured right) did emerge from our workshops in 2001. The exact specification of this car remains a secret!